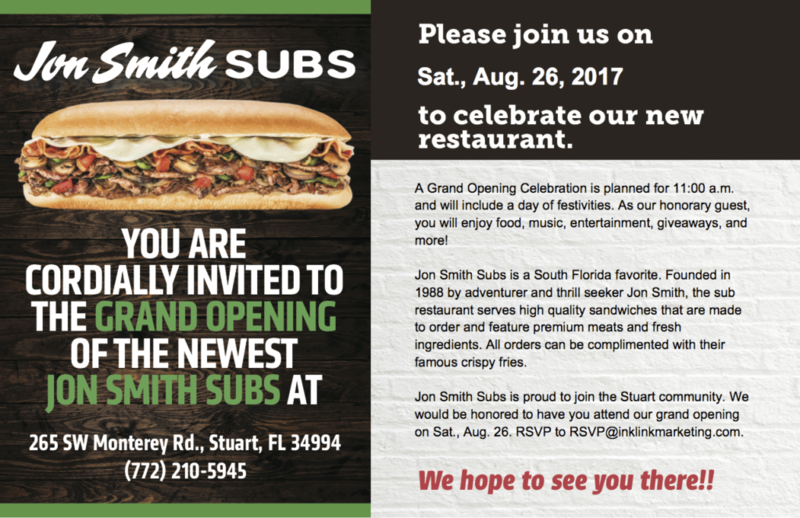 Home > EVENTS > Jon Smith Subs to Open its Newest Restaurant in Stuart! Jon Smith Subs to Open its Newest Restaurant in Stuart! Jon Smith Subs a new casual dining, fast table service concept offering high quality sub sandwiches prepared with fresh ingredients and boasts superior consistently in quality, is celebrating the grand opening of its flagship Stuart location on Sat., Aug. 26, 2017 at 11:00 a.m.
*After purchase, the first 50 customers in line will receive a coupon good for one free 6-inch sub per month for 12 months. This offer is valid after 08/26/17; limited one coupon per visit. Jon Smith Subs® grills up high quality subs with superior meats and fresh ingredients. Get your hands on one (or two) at the new Jon Smith Subs in Stuart. For more information about Jon Smith Subs and menu, contact Jessica Chacoff at 305.631.2283 JonSmithSubsPR@InkLinkMarketing.com, or visit Jonsmithsubs.com.